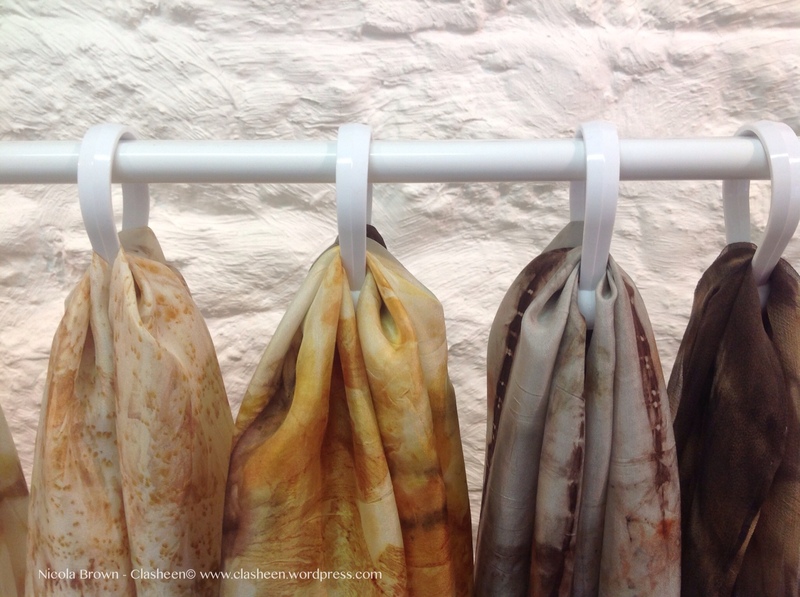 For a long while I've been mulling over how to display my new printed silk scarves to their best advantage without getting them all wrinkled, up to now I've draped them over props at fairs or arranged them as artistically as possible on the plinths and tables in the studio. In bed the other night I suddenly had a brainwave, why not find a simple but unobtrusive looking shower curtain ring that I could hang on the top bar of my Ikea clothes rails? Result! I love the fact that I can hang at least 12 scarves on the one rail without the display looking cluttered. Potential customers can easily compare one scarf pattern against the next therefore making decision time easier, I can then cover the scarves and leave them hanging on the rail during the week or if I need to transport them to a show remove the hooks and pack everything up simply and quickly. Here's a trial run of scarves that I assembled together at Duckett's Grove yesterday, now all I need to do is pick up a few more rails when I'm in Ikea then I'm ready in advance for any Christmas retail opportunity that presents itself out of the blue! 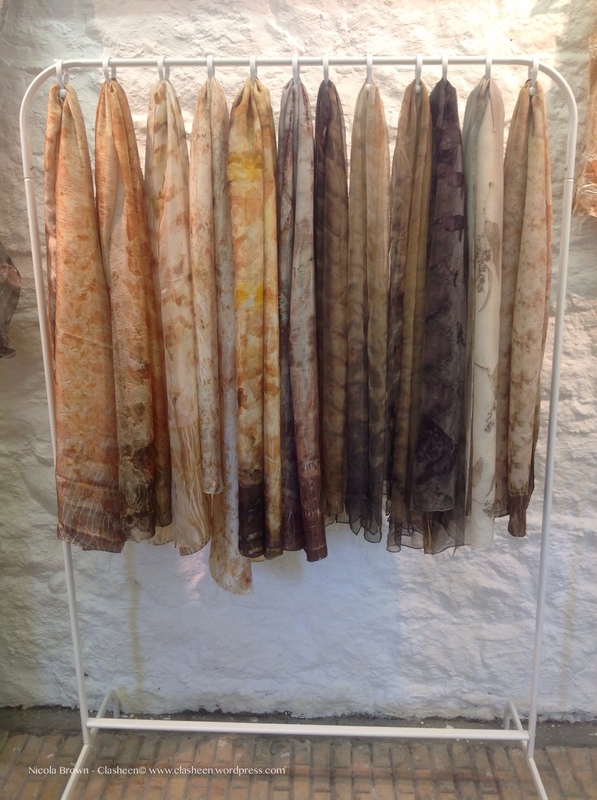 This entry was posted in scarf display, studio organisation and tagged craft fair display, scarf, scarf display, Studio, studio organisation by Nicola. Bookmark the permalink. How do u keep the end rings from slipping down the rods? This rail from Ikea has a little bump on the top at either end which stops the rings from slipping down! Brilliant idea! They can easily be seen in all their glory…yet packed up quickly. you are so smart!! Are you sure you weren’t an OT in another life??? that is amazing!! what a great idea!!! will do it for sure! thank you so much, you are always such an inspiration! Good idea – they look great! Brilliant!!! Looks great! I’ll bet those scarves sell like hotcakes! Terrific! When I’m at a “pipe and drape” show, I hang decorative chain from the hooks on the top rail, then put thin curtain rods through the links with the finials attached on the outside of the link, then drape the silk over the rods – but I like hanging them on individual hooks as you have and will add that to the mix! Hope you sold every last one!! Beautiful work….. Such a simple yet practical idea. Looks wonderful. Don’t you just love Ikea? Great iea. They look great! Totally brilliant Nicola 🙂 All the best with your Christmas sales. Hey Nicola, I just finished one of your new online classes. Looking for ways to display my scarves and saw this one of yours. I am going to give it a try. I have two fall shows lined up. Two of the scarves that I posted during our class popped up on Pinterest!! I loved you and your class and will take another when I have time. Thanks so much for the vote of confidence Joanne, it was a pleasure having you in the workshop! Good luck with your shows, I’m off now to see your scarves on Pinterest and see if we’re connected there!! !